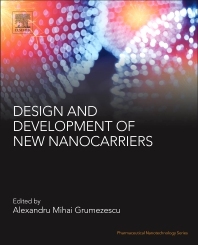 Design and Development of New Nanocarriers focuses on the design and development of new nanocarriers used in pharmaceutical applications that have emerged in recent years. In particular, the pharmaceutical uses of microfluidic techniques, supramolecular design of nanocapsules, smart hydrogels, polymeric micelles, exosomes and metal nanoparticles are discussed in detail. Written by a diverse group of international researchers, this book is a valuable reference resource for those working in both biomaterials science and the pharmaceutical industry.